Laparoscopic sleeve gastrectomy (LSG) has become an increasingly popular metabolic surgical procedure. Alteration in motor gastric function is a fundamental feature following LSG but still remains controversial. To determine the gastric emptying time 3 month after LSG, correlations between gastric emptying time and body weight, weight loss, and glycemia levels, alongside determining predictive factors of weight loss at the 3-month follow-up. Twenty-one patients were recruited in this study. Gastric emptying time was measured using a standard solid-phase gastric emptying scan at both baseline and 3 months after LSG. Paired sample t tests and a general linear model with repeated measures were applied to investigate the alterations in major parameters after surgery. 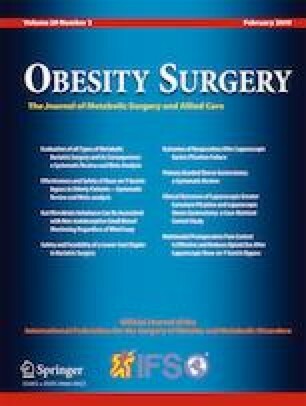 Univariate analyses were performed to evaluate the factors predicting weight loss at the 3-month follow-up. Compared with baseline levels, gastric emptying time, body weight, and HbA1c levels decreased significantly at 3 months after LSG (P < 0.001). Significant positive correlations were detected between HbA1c levels and gastric emptying time at baseline (P = 0.03). Significant positive correlations were detected between HbA1c levels at baseline and change in gastric emptying time (P = 0.03). Univariate logistic regression revealed a lower baseline BMI level to be independently associated with %EWL (P < 0.001). The rate of gastric emptying increased following LSG. Patients with a higher risk of type 2 diabetes at baseline had longer gastric emptying times prior to treatment and significantly shortened emptying times following surgery. Mengyi Li and Yang Liu contributed equally to this work. The online version of this article ( https://doi.org/10.1007/s11695-018-3571-7) contains supplementary material, which is available to authorized users. The authors would like to thank all of the involved study investigators, staffs, clinicians, nurses, and technicians for dedicating their time and skills to the completion of this study. This study was supported by National Key Technologies R&D Program (Grant No. 2015BAI13B09); Beijing Municipal Administration of Hospitals Clinical Medicine Development of Special Funding Support (Grant No. ZYLX201504); Research Foundation of Beijing Friendship Hospital, Capital Medical University (Grant No. yyqdkt 2017-31); and Wu Jieping Medical Foundation (Grant No. 320.2710.1813). This study was performed in accordance with the principles of the Declaration of Helsinki and was approved by the Ethics Committees of Beijing Friendship Hospital, Capital Medical University.